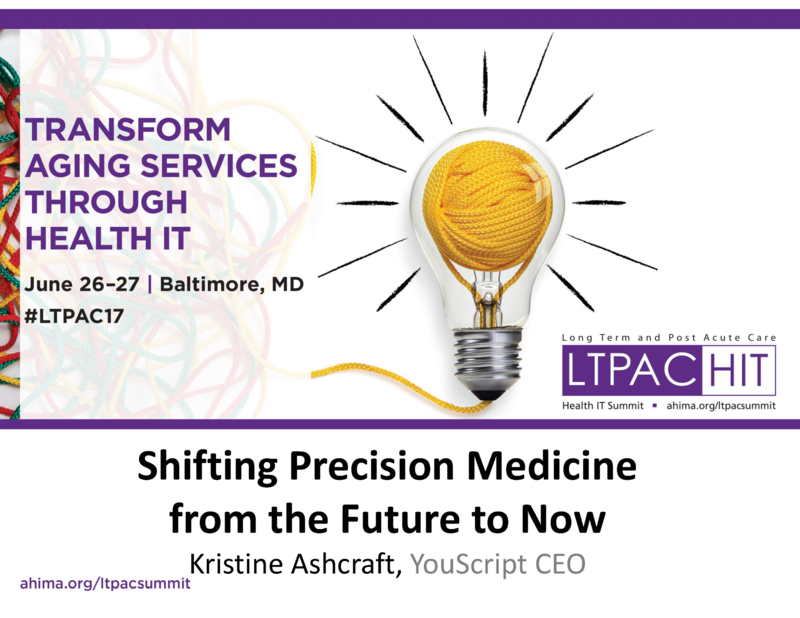 YouScript CEO Kristine Ashcraft attended the Long Term Post Acute Care & HIT Summit this week in Baltimore, MD to present a talk on the implications of pharmacogenetic testing, polypharmacy, and its impact on the elderly. Many in healthcare today consider precision medicine and pharmacogenomics something that will be of benefit in the future, especially outside of oncology. Healthcare systems are juggling multiple implementations and making major process changes to address the shift to value-based care. All this with a careful eye on the associated and constantly evolving regulatory and quality initiatives. The only way to rise above the noise is to provide proven clinical and financial benefits AND answer the key questions – who do we test and how do we act on it – within the clinical workflow. See new research that puts pharmacogenetics on the priority list in a value-based world, and learn how cumulative and gene-based interaction risk is being identified and managed in the EHR. The LTPAC Health IT Summit is hosted by the LTPAC Health IT Collaborative including AHIMA, the American Association of Nurse Assessment Coordination; the American Medical Rehabilitation Providers Association; the American Health Care Association; the National Center for Assisted Living; LeadingAge; the Center for Aging Services Technologies; Healthcare Information and Management Systems Society; the National Association for Home Care and Hospice; the National Association for the Support of Long Term Care; the National Pace Association; the American Society for Consultant Pharmacists; and the Home Care Technology Association of America.